I waited until today to post this on the Classic Comics Press blog so you all would know that this is not an April Fools gag. I'm tired. Since 2006 Classic Comics Press has published 19 books which is not bad for a one-man operation. Putting these books together is the fun part, all the other work that goes into running an independent publishing company is a hassle. Fulfilling orders, shipping, the day-to-day accounting, working with the various syndicates, etc., is time-consuming. I'd much rather be working on the books but it's time I got my ducks in a row when it comes to keeping the business affairs in order. And a few others I am not at liberty to reveal right now. These projects take time, the scanning, the cleanup, the design of the books - all fight for my time and me, still with a day job! Such is the life of an independent publisher. And don't you all start any rumors that Classic Comics Press is going under, far from it. I have enough projects right now to keep me going for the next 10 years, and I'm sure that more little gems are just waiting around the corner for me to discover. So that's it. 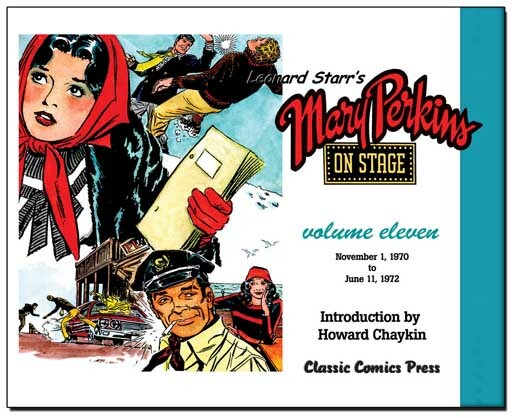 On Stage 11 and the redo of Volume 1 are now available. In December I'll be publishing On Stage Volume 12 and the first volume of Rusty Riley dailies. If things work out, I get caught up, and the funding is there I'll do my best to publish 6 books next year, that, if successful, will get me back on track. Both books are now available from Amazon.com, Bud's Art Books, Tony Raiola, Lone Star Comics, www.mycomicshop.com, and of course the Classic Comics Press website. I'll be posting more often to this blog and have tied it to the Classic Comics Press Facebook Fan Page. I've also set up an RSS feed between this blog and the fan page so those of you following this blog and our Facebook friends will get the latest updates simultaneously. Ain't technology wonderful? and look forward to a second. Take a short break if you must. But do continue the good work. Looking forward to you releasing Cisco Kid Vol 2. The artwork by Jose Salinas is superb.